Home » Baby Swimming Pool at Home! 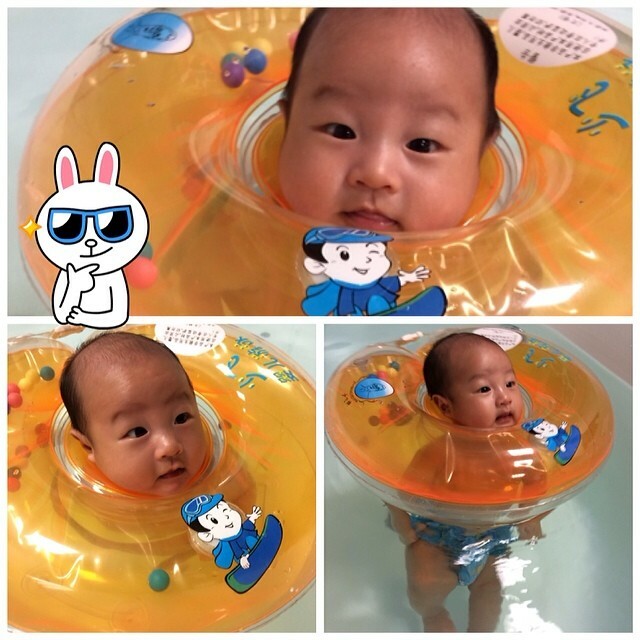 Baby Swimming Pool at Home! My friend Jessie gifted Daniel with a one time baby spa session at Babiescanswim at Punggol Plaza and so one fine day, my little family all headed down to the shop excitedly for Baby Daniel’s first ever swimming session. But as we all know, baby swimming sessions outside are really expensive. So I decided to get a baby swimming pool at home! Every time he takes a bath, Daniel loves kicking his legs in the water like he’s swimming. I was super excited to see how he’ll like a big pool to swim in. 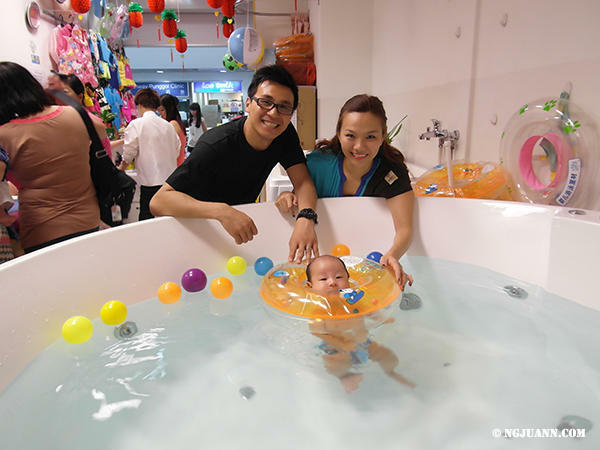 So before we bought any baby swimming pool for home use, first, we decided to go check out the baby spa session at Punggol Plaza. Here’s us and Baby Daniel at the huge Jacuzzi! He was such a good boy! He didn’t cry when I woke him up for the swim, put on the neck float and when I put him gently into the pool. He was still for a minute and then warmed up immediately and swam like a pro. Awww so proud of him!! Immediately we made up our minds to get an inflatable swimming pool at home for Daniel. Taking him out for a swim is just too much trouble and we do want to let him swim as much as possible. A home pool is the best solution logistics wise and cost wise. The aunties there were REALLY good at hardselling. Kept saying things designed to make us parents feel like guilty bad parents if we don’t sign the package with them. If I didn’t already have a plan to buy a pool at home, I would have signed with them because of guilt. I left the place in disgust. I don’t know about you but I find the option of getting a home pool is a better choice. 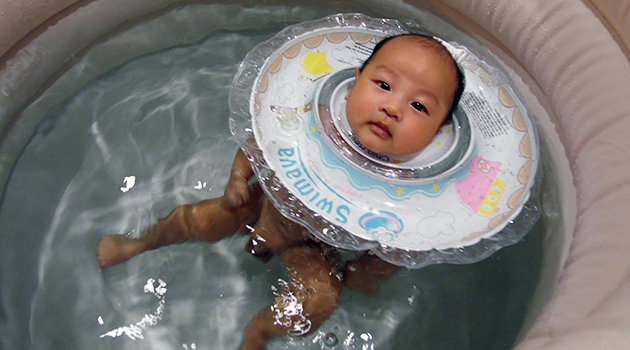 So I started a search online for home swimming pools for babies. There are basically three places to buy. There are two sellers on Qoo10 that do preorders and they are quite popular because it’s very cheap at $50~70 per pool set only. This was tempting to buy but I decided against it because a friend who bought from these sellers said that the pool is supported by these metal rods and without water, the pool will topple and the walls of the pool is very thin. And besides, they obviously get their stocks from China… And I’m guessing Taobao. I might as well check out Taobao. Seeing #1 led me to Taobao. It cost about S$20 only but add shipping in and it’s about S$40. The wait is about 2 weeks long. I am concerned about warranty and there are so many sellers that you don’t really know who to go with. Probably you can go with those with highest ratings. My concerns on quality remains because those that are on Taobao are similar to the ones selling on Qoo10. On Taobao there are many other designs and sizes. If you’re open to owning a big pool, do check out Taobao. I remember seeing a baby pool selling on MyMiracleBaby.com.sg when I was last browsing through their SwaddleDesigns. I decided to go back and take a look. The one they are selling is by the international brand, Swimava with strict safety standards. MyMiracleBaby is the Singapore distributor so it’s exclusive to them. The pool itself is made of a thick, high quality hypo-allergenic PVC plastic and free from Bisphenol-A which feels sturdy. I like that I can inflate this layer by layer. I can choose to lower it or make it to the highest level depending on Daniel’s preference of using it as a swimming pool or as a wading pool. I had no problems inflating this with the pump included in the set. The little handles underneath the neck float is great! Daniel has started to hold on to them while swimming. This is one of the best forms of parent-child bonding and I would totally recommend all parents to get it :) I know there are concerns that a lot of water is wasted when using home pools. But it really depends on how you see it. After Daniel finished with it, my helper will use the water to clean the toilet and the floor. She finished using all the water to clean our 4 room HDB within a day. UV Steriliser versus Steam Steriliser – which one to choose?